The Board of Supervisors doesn’t plan to renew its police department contract at the end of this year because the department’s lone officer has decided to join the Teamsters union, board chairman said. One Officer voted to join the Teamsters Local a few months ago, voiding the renewal of the township contract. The current contract, in effect since 2004, states it will automatically renew every year, unless the board gives a 30 day notice of its intention not to renew, he added. Days later, the Council voted 3-2 to ignore the police union contract and immediately dissolve the police department. Minutes later, two police officers were told to get their personal belongings out of the police station. A constable stood by as a locksmith changed the building’s locks. One councilor resigned in protest. Police departments are trying to disband their Teamster-represented forces. Local 776 has viable information that West York Borough is looking to dissolve its police department. Middletown is looking to disband, having outsourced their 911 center. They’ve furloughed police officers and public works employees already. A year after a mentally ill homeless man was beaten by police officers and later died, Fullerton leaders are expected to launch a study that could set the wheels in motion to disband the city’s 104-year-old Police Department. The Waldo City Council voted 4-1 on Tuesday to disband the police department and have all law enforcement functions in Waldo be taken over by the Alachua County Sheriff’s Office. I can’t help but think with the complete disrespect shown by the police union to the Mayor of New York and in some ways the President, is it possible for the federal government to disband the police union? 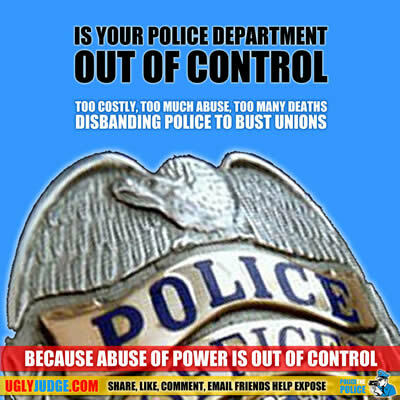 As they have shown complete disregard of hierarchical authority and have remonstrated against any checks and balances, it is with that in mind that I asked the question, can the police union be disbanded? In growing voter anger over rising taxes and high union costs, numerous small towns are voting to disband their city police departments and contract with the sheriffs department instead. Police assoc. says city planning to disband police dept. Despite harsh words from Hamilton County Prosecutor Joe Deters, who on Wednesday declared that University of Cincinnati police officers aren’t real cops, the department has no intention of disbanding. So said UC President Santa Ono, who promised a thorough review of department policies, procedures and training in the wake of the July 19 shooting death of 43-year-old Samuel DuBose. DuBose’s death during a traffic stop resulted in the first-ever murder indictment of a Cincinnati officer in the line of duty when Deters leveled the felony charge against Ray Tensing, a 25-year-old who joined the 78-member department in April 2014. On Internet message boards, police union activists instructed the rank and file to refuse to respond to incidents unless two units were dispatched to the scene, and to double up even if given orders to the contrary. Under this “wartime” footing, the police would simply seize the power to deploy and assign themselves, as they liked – and to hell with the chain of command and civilian authorities.